Elenos has launched a new remote control system for networks of transmitters. It is quite clear what it is used for, but still little is understood of how innovative, powerful and valuable this novelty offered by the Italian company is. Elenos, an Italian company with headquarters in the city of Ferrara and as leader of the group that include the Itelco and Electrosys brands, has decided to assert a new Network Management System concept. For this purpose it has developed AVATAR, which is capable of managing not just a certain number of individual transmitters, but networks of transmitters in layers, defining the traits for each group in terms of coverage, the type of audience, and the type of population density (this is relevant also for seasonal broadcasters, which are typical of tourist resorts). The data, which is organised and analysed by the system, allows you to better manage your network, from the energy cost to the output powers, so as to monitor the history of failures in each station and to attain, thanks to the system, accurate failure prevention. 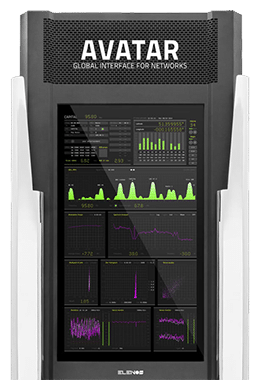 Thanks to AVATAR the problem of transmitter network management is resolved through a centralised interface that analyses current and past data, allowing you to discover or even predict problems and to intervene in a timely fashion. The suite includes Avatar Interface, the device within the station that communicates with the AVATAR system. This collects the data and sends it to the headquarters through a private cloud. The device promptly notifies of significant events and can include a variety of tools, including a quality analyser of the mains (capable of measuring and storing events such as network failures, fluctuations in voltage and frequency, service downtime and other abnormalities), an FM receiver-demodulator with ultra-high performance (capable of providing information on the quality of the signal emitted), and other tools equipped with a USB or Ethernet interface. The Main Data Module controls the parameters of each transmitter and the entire network, analysing performance, variations, and trends and then takes action to change them, either remotely or locally. The Energy Managing Module provides the energy cost of the entire network and operates in a manner aimed at optimising consumption: it also calculates energy costs for different time periods and for different energy suppliers. The Maintenance Module manages prompt interventions for troubleshooting and organises management of route maintenance intervals for the benefit of savings management. The Quality & Measurements Module detects the quality of the in/out audio, analyses the signal transmission and audio band quality of the L & R channels up to 16kHz, displaying the stereo separation of the transmitted signal. It also carries out statistical and temporal analyses on the progress of frequency deviation and controls the quality of the RDS signal. Finally, the Network Managing Module examines the entire network of transmitters, highlighting different types of data on several layers, so as to analyse and precisely intervene in groups of transmitters with common characteristics or problems.